Take Hwy 101 north past Santa Rosa and then… Take the last Cloverdale exit to Fort Bragg, Hwy 128. Go left at the bottom of the exit, go less than a mile up the hill and turn right onto Hwy 128……get ready for a curvy road! Philo is about 5 miles northwest of Boonville. Just before Philo there is a big dip in the road where the speed limit becomes 30 mph and the mill will be on your left, then Lemon’s Market on your right, then a gas station on your left where you will turn left onto Ray’s Road just before the Anderson Valley Inn. Go on down Ray’s Road, veer left at the “Y”, then straight down (keeping right after the “Y”) into Van Zandt’s – you’ll see the entrance with the sign. Roughly 2.5 hrs from San Francisco. Take 80 west and make your way to 101 – various ways to do it, but we usually go through the Napa area on 12, 121 and 116. Take Hwy 101 north past Santa Rosa and then… Take the last Cloverdale exit to Fort Bragg, Hwy 128. Go left at the bottom of the exit, go less than a mile up the hill and turn right onto Hwy 128……get ready for a curvy road! Philo is about 5 miles northwest of Boonville. 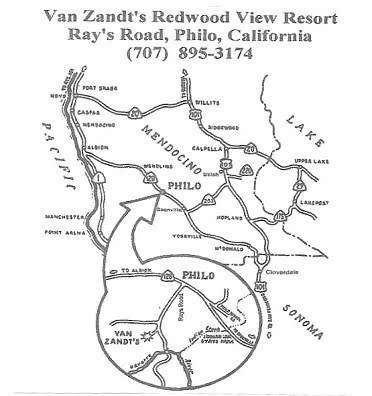 Just before Philo there is a big dip in the road where the speed limit becomes 30 mph and the mill will be on your left, then Lemon’s Market on your right, then a gas station on your left where you will turn left onto Ray’s Road just before the Anderson Valley Inn. Go on down Ray’s Road, veer left at the “Y”, then straight down (keeping right after the “Y”) into Van Zandt’s – you’ll see the entrance with the sign. Roughly 3.5 hrs from Sacramento. Take Hwy 101 south to Ukiah. South of Ukiah take Hwy 253 to Boonville. Turn right onto Hwy 128 south of Boonville. Philo is about 5 miles northwest of Boonville. Just before Philo there is a big dip in the road where the speed limit becomes 30 mph and the mill will be on your left, then Lemon’s Market on your right, then a gas station on your left where you will turn left onto Ray’s Road just before the Anderson Valley Inn. Go on down Ray’s Road, veer left and down at the “Y”, then straight down (keeping right after the “Y”) into Van Zandt’s – you’ll see the entrance with the sign. Roughly 4 hrs from Eureka.